Dating back to the times of Aristotle, he praised the virtues of leisure. He believed it was a way to gain self-understanding. It was simply life lived with openness and connecting to every day experiences. Aristotle was not alone. The ancient greeks valued leisure and had a word for this - schole. Schole is about setting aside goals and hustle to take time to seek truth. To accomplish this, the goal was to simply see what is around us and experience what is without personal agendas and desires interfering in the moment. No goals, no thought of the to dos on our list. Schole is done simply for the purpose of being open, connected to our world and able to embrace goodness and beauty when we see it. In a world of hustle and go, we are starting to miss a lot. Our focus becomes laser sharp, stopping for a breath of air seems wasteful, and we miss the beauty and gratitude for the small things that bring us satisfaction in life. Self-care creates space to cultivate an intentional life that allows for things that energize you and brings you deep satisfaction in life. And self-care is a divine responsibility. But, say the words "self-care" and you’ll get eye rolls and excuses like, “I don’t have enough time” or “but my partner/child/parent/job really needs me”. And mention planning a leisurely activity and it is often looked upon as downright criminal. 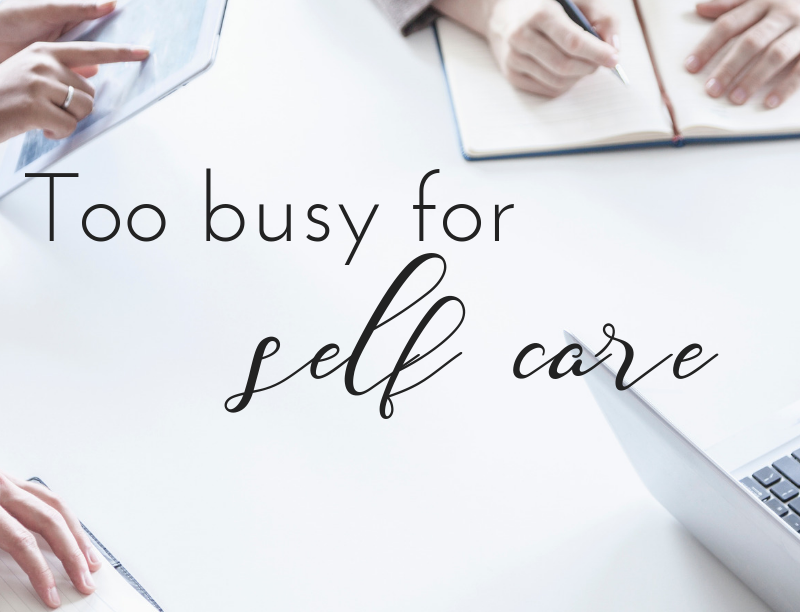 Why is it we are so willing to put the needs of others in front of very basic self-care? Why are we taught that saying no and taking a bit of time of our own is selfish? Don’t get me wrong, I struggle too. Every single day. I struggle to keep my chronic medical condition at acceptable levels and with not giving everything I have away. It’s hard to find a balance. There always seems to be something more important. That load of laundry or those last few forecast numbers or the lawn or, or--you get the idea. The reality is, taking good care of ourselves is the most important thing. When we neglect our own well-being, we have no gas left in the tank to truly give our best to the people and activities we most love. Self-care can be as simple as taking your lunch break away from your desk at work, this simple tea meditation, taking a nap when you need one, or more serious like taking your medication as prescribed and seeing your doctors as you should. Reading, gardening, massage, gaming or, yes, floating, can be part of a healthy routine. As long as it is time devoted to you and improves your life physically, mentally or spiritually, you’re doing it right. And these small things bring us three important gifts that can mean the difference between meeting each part of your day with exhaustion or confidence - rest, pleasure, and health. In yoga, the savasana, also known as the corpse pose, is used for integration. Laying flat on the floor, palms up, the breath deepens, and you find the sweet balance between relaxation and meditation. It brings the work you just did deep into your bones. It is a moment to stop, reflect, and sometimes just rest before moving into the next project or activity that bring you face to face with the stress of the world. Some yoga teachers will tell you if you don't take the time for savasana that you will miss out on the benefits of the work you just did. Taking some time without any expectations, time to just be for a while is important to our health. Spending time in a hobby you enjoy, immersing yourself in nature through a walk or hike or in a kayak on the lake are excellent ways to get lost in the world and just enjoy life. What brings the biggest smile? What have you done that make you pause and think, “this is the life!” Do that thing more often. Make time for it. Your mind, body and loves ones will thank you for it. The medical community backs up the importance of a good self-care routine, but acknowledges it's not easy and often takes time to develop a support system and new mindsets. But changes in these areas are valuable. A self-care system helps keep chronic medical conditions in check and gives us a chance to reset mentally. If you are struggling with a chronic pain condition, the float4health float program may help you create support around a new self-care habit as you make life changes. When we set aside time for ourselves, we reduce stress levels and the impact of stress on our bodies. We just feel better and who doesn’t want that? The bottom line is you deserve to be taken care of too. You are worth the investment of a few minutes each day to ensure you’re right where you need to be--rested, focused and at your best. You make time for everything else, why not make some time for yourself?